The damn thing contains over 4000 chemicals. But its a funny thing still; And quite interesting to see how one gets hooked on to it. Its not something that anybody likes on the first go; Or the second or the third. I guess it will need at least a week or a month before one really begins to appreciate what it does to you. Then what makes one go through that first week or month. The main reason is the image which the society gives to the act of smoking; There is something of a 'manliness' about it; But then even girls do smoke. So more deep down, there seems to be images associated with smoking, like independence, confidence etc. So in the initial stages, its more of an exploration of a new found 'dimension' or 'image' which the act of smoking brings to you; The person feels elevated to a new level of character, with a new dimension and absolutely explores the world of thrill and manliness and independence. Soon after addiction kicks in slowly, when the act of smoking begins to plug itself into various stages of your daytime. 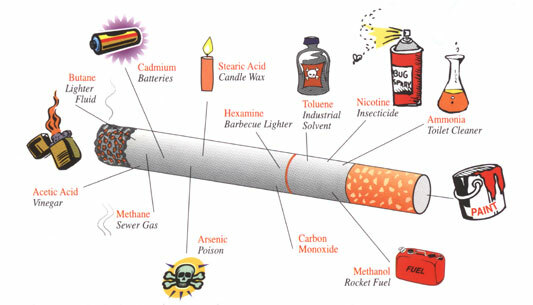 Within 10 seconds of the first puff, your body begins to flood with nicotine and it reaches the brain. Now the good ol brain has a pleasure center - a cluster of cells which has a wide reach over different functional units of the brain. It does the simple act of releasing pleasure chemicals like endorphin and dopamine - This used to work as a reward mechanism for carrying out tasks essential for survival. But then unfortunatly the human brain grew powerful enough to observe around and discover chemicals like nicotine which offer a shortcut and provide the 'reward' or 'pleasure' without the burden of carrying out survival-related tasks.. So you get latched on to it and go deep more; And soon what you get while you smoke, what you think as a 'high', is in fact the same as a non-smoker's normal brain state; That is, soon you reach a condition where you need a smoke to feel normal, to feel like the way you used to feel always while you were a non-smoker. All the rest of the time, you are more or less in a sort of depression. You use regular smokes to rise out of it and feel normal for a few minutes and then go down back again. Ever noticed smokers talking about quitting smoking WHILE smoking a cigarrette. Quite natural since while smoking a cigarette you are satisfied; In fact right then you are normal. There is no urge and then quitting smoking seems quite possible. You finish off the smoke wondering why you need the damn thing and walk away determined to quit. 15 minutes later you dive back into the depressed state and then quitting smoking seems the most impossible thing in this world. You crawl back to the next smoke and again its the same old round, you wondering why you need this and how easy it is in fact to quit. In fact a regular smoker is capable of quitting, only WHILE smoking. What an irony. Of course people do quit - with tons of willpower or medical bills. But for how long. Only around 3% manage to escape the devil. And combine smoke with booze; Its like a Nitro which kicks off in your brain.